Henry John has fond memories of childhood holidays spent at his father’s rural home, which he helped to restore and extend. 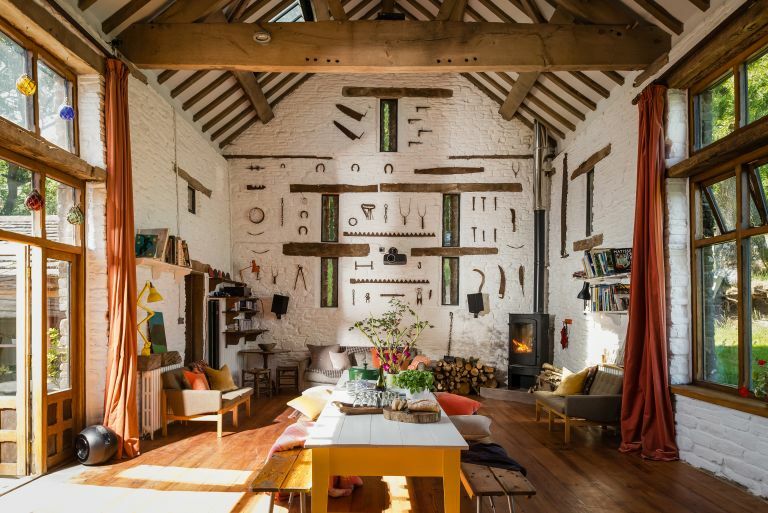 In a Herefordshire valley accessed by a mountain road, the farm cottage, barn and outbuildings date back to the 15th century, and various phases of redesign and renovation have taken place over the years. Looking for more inspiration? Browse our real home transformations. Read our guide on renovating a house, too, for more guidance. Situated on the edge of the Brecon Beacons and dating back to the 15th century, the tumbledown farm buildings lay untouched for decades. Henry’s father planted 1,500 trees on the site and Henry recently purchased an additional 10 acres of land to plant his own woodland. Owner Henry John, an artist, lives here with his lurcher dog, Arrow. Henry also manages the property, Charity, as a holiday rental through uniquehomestays.com. Property A six-bedroom, detached 15th-century cottage, barn and connecting extension in the Black Mountains, Herefordshire. What he did Henry carried out a major renovation including underpinning and rebuilding walls, damp-proofing, and excavating floors. The internal layout has been reworked: the barn has become a living/dining space and a new kitchen now connects directly to the sitting room. The modest cottage stood on a working farm and was surrounded by other derelict buildings including a hay barn where Henry and his brother used to play. In 1989 their father bought these buildings from the farmer and set about joining them to the cottage with a new annexe, built using reclaimed materials to create a bigger home. ‘Knocking through walls and opening up windows to create a better flow, more light, and views from the house was instantly rewarding,’ he says. Henry wanted to retain the style and footprint of the existing buildings, which remain unlisted, but was determined to bring them up to date with modern heating and wiring systems and a few high-tech luxuries. His background as a trained painter, coupled with the practical skills originally learnt from his father, enabled Henry to tackle almost every element of the work himself. Five months into the project, when the house was still a virtual shell, all but one of the tradespeople had left the site and the remaining builder continued for a further two years. A great deal of money went into hidden but essential tasks such as damp-proofing and underpinning the older elements of the building. Even bringing a mains water supply to the house involved locating the spring, installing a 10,000-litre tank and trenching pipework over acres of fields. Attending auctions to furnish the house led Henry to purchase some eye-catching pieces, such as a green velvet chaise longue, but he also made much of the furniture himself, including the oak kitchen cabinets and dining table. ‘My main intention was to try to keep the soul of the house, and I was mindful of that throughout, as well as being influenced by my father’s taste,’ he says.